For patients having cataract surgery or Clear Lens Exchange , an exciting new option is a bifocal lens implant which is designed to provide both distance and near vision called the ReSTOR Intra-Ocular Lens (ReSTOR IOL). Over the age of 40, the natural lens in the eye loses its ability to focus up close, and patients must wear reading glasses or bifocals for near vision tasks such as reading. 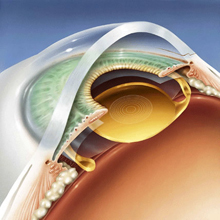 The ReSTOR IOL is implanted in your eye at the time of cataract surgery or Clear Lens Exchange, and is designed to provide a full range of vision, from near through distance vision, and greatly reduce your dependence on glasses. In clinical studies, 80% of patients receiving the ReSTOR IOL reported that they never needed glasses for any activities, including driving, playing sports, watching television, working on the computer or reading fine print. The ReSTOR IOL is not an option for every patient, and your surgeon at New Vision Laser Center will discuss whether it is right for you. Contact us to find out if ReSTOR IOL might be an option for you.